This is Part 2 of the series: “State of Front-End at Fundbox”. Part 1 covers the existing infrastructure at Fundbox and our motivations for redesigning it. Part 2 presents the research behind choosing a new framework: React, Vue or Angular to migrate into. Part 3 describes how we are migrating from Angular to Vue while still committing to a demanding product roadmap. We’ve researched for a few long months to support a better decision on this emotional topic; conducting discussions, building a proof of concepts, interviewing colleagues with relevant experience in other companies, and reading tons of material online. The goal is to build a new, modern, fast and reliable platform to serve all of our current and future front-end apps. Angular is our current framework, we’re on v1. Angular v2 was introduced with many improvements, but it wasn’t backward compatible. That means upgrading to latest Angular requires similar efforts as switching to any other framework. As a result, motivation to use Angular has dropped majorly, within Fundbox and in the industry as a whole as developers was let down. Angular grew to become a big framework that can be helpful in building complex systems but is less useful for building startup fast-changing UIs. React and Vue are more light-weight, and components are meant to be small, autonomous, encapsulated, hence — easily reusable. If we were to develop a new infrastructure from scratch (and not needing to migrate from an existing one), we could have been considering Angular too. In our case, it didn’t fit. If anyway we’re en route to rewrite significant parts of our apps, it’s an excellent opportunity to learn new technologies as we go. This way we can broaden our knowledge and enrich our developers’ experience. How easy is a framework to learn for an experienced developer? How readable and intuitive is the code and conventions of the framework? How intuitive is browsing and maintaining a component in the framework? How performant are apps built with the framework? How big is the footprint of the framework concerning package size and memory usage? How many features is the framework offering out of the box? How many of its features are mandatory? How easy is it to customize the framework? What tools available for the framework? How many stable plugins are there for the framework? Does the framework support more applications other than web? Does it offer a way to build native mobile applications? How big is the framework’s community? Is the community united or fragmented? How long has it been production-tested? How clear is its future? How big is the team behind the framework? Is there a company or organization that owns the framework? How easy would it be to hire developers with prior experience in the framework? React official documentation offer a couple of Getting Started guides that are decently written and give a decent walk-through to newcomers. The framework’s core principles can be understood in a couple of hours, by developers with some front-end framework experience. The official React documentation is thorough, but not as clear and organized as the official documentation for Vue. The documentation covers the necessary happy flows and then some more, but there are still edges of the framework that are missing from the documentation. These edges can convert to pain points as the project will get bigger. React is not a complete framework; it is lean at its core and the more advanced framework components must be looked for as a third-party package. This adds some complexity to the learning curve as it differs based on choices you make with the framework along the way. The Vue library can simply be loaded as a resource of an HTML page; through this, the whole library can be used without a build step in just minutes. This reflects how unobtrusive the library is in general, and also allows writing Vue apps in no-time. Because Vue shares some concepts with both React and Angular, transitioning developers will have an even easier learning curve into Vue. Also helps the fact that the official documentation for Vue is very well written, and covers just everything a developer would stumble upon while developing Vue apps. Vue is more tightly defined than React; that also means it is more opinionated. It is noticeable that in Vue many questions are answered straight in the documentation itself, not needing to search too much in other places. Being a younger framework than both React and Angular, Vue took the better things from each, a mix of functional and OO programming. By default, Vue’s coding style is a little similar in some areas to Angular but also removes most of Angular’s pain points. Vue separates HTML, JS and CSS, like web developers have been used to for years, but it also allows to use JSX if you prefer that style. So it doesn’t force changing your code style. Vue’s take of the component lifecycle is more straightforward and more intuitive than React’s. In general, Vue’s API is broader but simpler than React. That said, React’s special syntax requires more learning and practice to feel comfortable with writing components in React. Single File Components in Vue split into three separate parts: <template>, <script> and <style>, and each contains the corresponding type of code, and so it feels more natural for transitioning web developers. As a progressive framework, Vue is easily customizable. For example, with a single configuration, one can use JSX instead of the <template> tag. Also, as another example, just by adding a lang=”scss” attribute to the <style> tag, one can write SCSS instead of plain CSS. Similarily, by adding the scoped attribute to the <style> tag, Vue components will implement CSS scoping (a.k.a CSS Modules) out of the box. Edit: It’s worth mentioning that performance is a bit hard to measure, because it very much depends on the specific app that you’re building, and even more it depends on how you build it. Comparing DOM manipulations, React’s overall performance is great. It is much faster than Angular but is a bit slower than Vue. React offers support for Server-Side Rendering (SSR) out of the box, and could come out useful for some types of implementations. Built-in support for bundling and tree-shaking for minimizing end-user resource burden. Aside from being the fastest in the bunch, Vue is also a progressive framework, build from the ground up to be incrementally adoptable. The core library is focused on the view layer only and is easy to pick up and integrate with other libraries or existing projects. Similarly to React, Vue has built-in support for bundling and tree-shaking for minimizing end-user resource burden. React focuses on UI, so the essential thing you get is its support for building user-facing components. What it doesn’t offer as part of the React official library is more advanced features like state management. Most of React applications are using Redux for state management, and these days MobX is gaining traction also as a React companion. Even React router is not an official package, but a third party package, backed by React’s team. As a progressive framework, Vue allows just using its most fundamental features to build an app, but if needed, it also offers most of everything you need out of the box: Vuex for state management, Vue Router for app URL management, Vue Server-Side Renderer for Server-Side Rendering. Vue is more opinionated than React, for the good and the bad. React has a third party CLI tool called create-react-app that helps scaffold new apps and components in a React project. The CLI tool also supports the ability to run end-to-end and unit tests, code linting and the local development server. React has great official and community support for the major IDEs. Vue has an official CLI tool called Vue CLI. Very similarly to React’s create-react-app, Vue CLI tool offers scaffold of new apps. Also Vue has good support for all significant IDEs (not as good as React, but WebStorm and VSCode are there). There are a plethora of apps in production built using React Native. For Vue, there are more than just one option to go with for building Mobile Native apps. Although, unlike React Native, there’s no clear leader in the Vue-Mobile-Native space. NativeScript is the leading of these options (and it’s also a leading solution for Angular btw), but there is also Weex and Quasar. There are over 40,000 npm packages available to install for React developers. In latest front-end tools surveys, over 40% of respondents voted they feel comfortable using React. In GitHub, React repo has almost 100,000 stars. React’s community is indeed much more significant but has the disadvantage of being more fragmented than Vue’s, and it’s harder to find straightforward answers to common problems. For Vue, there are almost 10,000 npm packages available to install. In the latest surveys, 17% of respondents voted they feel comfortable using Vue. But in fact, twice as many developers are interested in learning Vue, comparing to React, so the market for Vue devs will probably grow faster than React’s in the coming future. The Vue repo in GitHub just passed React and went over 100,000 stars. Thanks to its excellent documentation, most answers to problems in Vue development could be found in the documentation right away, but also the community answers are more aligned. React was released in March 2013 (5 years old at the time of writing). According to SimilarTech, React is in use on 205,000 unique domains. Growing at 2.46% per month. React is very well tested on production, more than Vue. React has built a vast community, which makes sense with an owner such as Facebook. Vue was released on February 2014 (4 years old at time of writing). According to SimilarTech, Vue is in use on 26,000 unique domains. Growing at 3.34% per month. Vue became a standard around a year and a half ago. Today it is widely used, also in some bigger companies like GitLab, Alibaba, Baidu and more. Vue proved to be stable both at runtime and with updates. React is a framework founded and maintained by Facebook. At Facebook, there’s a team that regularly supports React (and React is also being used for many projects within Facebook). The React team size at Facebook is said to include 10 dedicated developers. But it should be noted that multiple teams at the Facebook R&D are using React for internal and external projects, and each of them can push change requests into the library. React doesn’t have an actual roadmap, but work based on RFCs, as explained here. Vue is an independent library, founded by Evan You. He also manages the maintenance of Vue and its roadmap ahead. The Vue team size includes 23 dedicated developers. Vue’s high-level roadmap can be reviewed in their GitHub repo, here. Being the most popular framework out there these days, React has an advantage if you’re in the market for React developers. Also, by learning React, developers will get an immediate well-worth line to their CV, as they will gain valuable experience with a popular framework as React. Vue is the new “hotness” in the front-end industry. Of course, hype has also some downsides, but Vue has been gaining stable traction for a long time and developers are eager to get their hands on a Vue project as part their FOMO. These days, it is not uncommon to find developers who have some experience with Vue. Skilling FEDs with the most popular framework out there. Easier hiring of strong FEDs. More secure future and stability, based on a stable past and a strong backing company. More significant community, a plethora of tools and packages. Web and mobile apps can share some code. Vue’s core modules (Vuex, Router, etc.) are built-in and work fantastic. Being more unique; leading the herd and not following it. Much faster ramp-up phase, both FEDs and BEDs would feel natural in Vue code, fast. Better promotes Full-Stack culture; allows cross-product development. Keeping the division between FEDs and BEDs; React requires to learn a lot to become an expert. Would require much more time to train devs. Deliver slower (at least for the initial heavy lifting). Stepping in a more experimental land, not risky, but edgy. More difficult to find experienced Vue devs. Fewer plugins and tools available, smaller community. Not being React, devs don’t gain experience with the most popular framework today. For a long time React and Angular were the leading players in the framework game, while many (many!) frameworks appeared every other day trying to get into the hall of fame too. None succeeded; except lately — Vue. 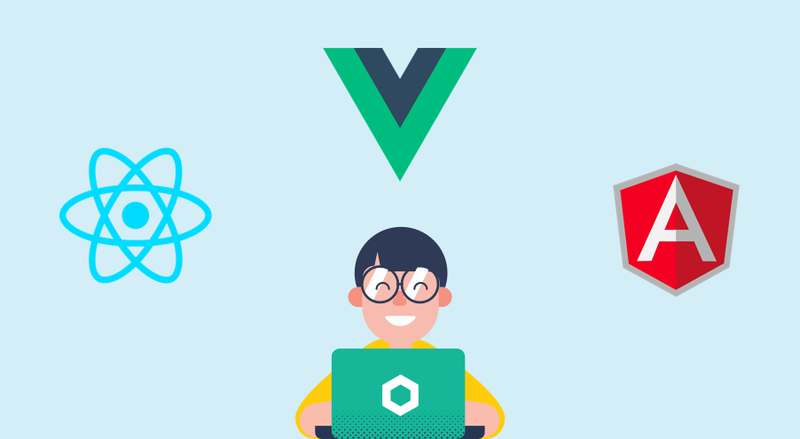 The most apparent appreciation and popularity Vue has attracted can be seen in references in articles, tutorials, POCs and browser developer communities. React is a trend-setter and a highly demanded skill in the industry. React is a clear leader today, both in industry-hype and community appreciation. It’s super-popular and, to be honest, it deserves the status very well. React makes it easy to build both complex and straightforward web and mobile applications, but it comes with a price — framework complexity and boilerplate. The basics are relatively intuitive, but large React projects tend to get complicated, and the fragmentation in the community does not help. The fact that React introduced many new paradigms has some negative effect on its learning curve. Vue is leaner, a straight-forward, and fresh framework that deserves a place on the podium for being super simple to learn, very low on boilerplate code, performant, flexible and complete package. Many web apps today, could have been built faster with Vue than with React. Vue is fun to develop with and is pretty straightforward. The steadily-growing good vibes around Vue within the front-end community lately, can easily hint of Vue becoming at least as popular as React very soon. In part 3, I present our selected framework, explain why and how we are migrating our existing front-end infrastructure while still committing to a demanding roadmap of a technology startup as Fundbox. Technology to grow your business.